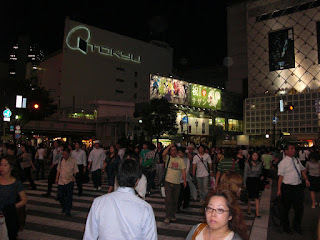 I was told by the concierge at my hotel that Shibuya is ‘young and exciting’. She was right on both counts. The district almost pulsed with a dizzying tide of human movement… I wish I’d videod the crowds crossing the road. It made Piccadilly Circus look calm. I wandered through a number of department stores, including Shibuya 109 (no men’s floor and a lot of excited teenage girls), Marui City (with scary prices) and Shibuya Mark City (with a Harrods outlet, so even more scary). I dodged into a very busy restaurant and someone helped me to choose some ramen. Very different from anything I’ve eaten in London’s Japanese restaurants and certainly a world away from Wagamama. The soup part was very salty and the noodles were softer than I expected. Anyway, delicious!